(CNN) -- Officials have uncovered a common grave in Paraguay that contained at least two bodies of victims believed tortured and killed under former strongman Alfredo Stroessner, authorities said. 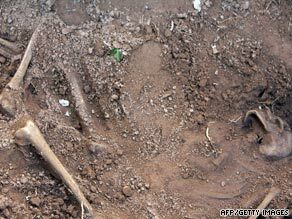 Human remains are discovered Thursday in an Asuncion, Paraguay, neighborhood. Speaking at the grave site Thursday, President Fernando Lugo called it the remnants of a "painful period" in Paraguay's history. Stroessner held power from 1954-89 and was known as a brutal dictator whose regime tortured and killed hundreds of government opponents. The bodies were found in Tacumbu, a neighborhood in Paraguay's capital city, Asuncion.